Remember when (just two days ago) I said I was “so over” Halloween? So do you know what I forgot? I forgot that pumpkin patches (at least the ones around here!) sell food. Good food. Like greasy, fattening, sugary carnival food. And Saturday that’s just where we went…to the pumpkin patch, where they were serving fresh roasted corn on the cob, caramel apples, polish hot dogs, chili, mini donuts (hot from the…well, wherever it is that donuts come from), and pretty much anything else you could possibly want. All I know is that I ate…a lot! 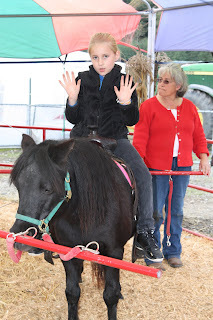 They also had pony rides for the grown-ups. 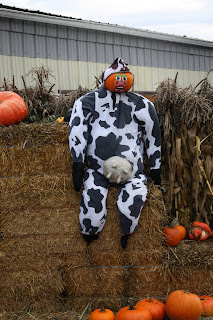 I gotta tell ya, after a day of power-eating, my Halloween spirit is back! Move over eggnog, I’ve got a serious hankering for a pumpkin spice latte, baby!!! But let me ask you this, is it weird that all of my holiday spirit seems to be tied to seasonal foods??? I've been drinking Non-Fat White Pumpkin Mochas for a couple of weeks now. SO de-lish. And you think you ate bad this week? My mom decided to put together a pre-Thanksgiving Thanksgiving dinner. Entirely mouth watering but oh my...sooo much turkey, stuffing, creamy mashed potatoes, homemade oatmeal rolls, green bean casserole, candied yams, ginger carrots, pumpkin pie, apple pie with american white cheese crust, and perfect pecan pie, with large dollops of whipped cream. Yeah...I tried a little bit of EVERYTHING. AND I was sent back to my apartment with leftovers. Oh no!! But you're right. All my festive feelings are tied with food! I can't wait for Christmas-time. My mom and I make dozens of different kinds of Scandinavian cookies (with some other random favorites thrown in, like Special K Bars http://jennyswanson.blogspot.com/2010/04/special-k-bars-recipe.html) and we package them up in cookie tins for all our favorite people so they can enjoy some tasty treats! Oh my gosh, I can't wait. Hey MickeyJ - I never thought about NOT having them...I suppose shouldn't take them for granted. This is HILARIOUS! 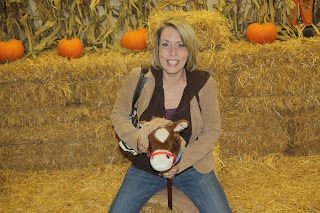 I love the horse in bale thing! 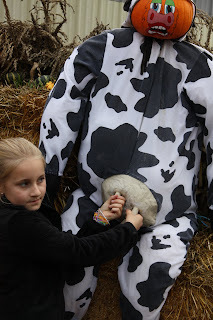 =))) Halloween is SO FUN! But I don't go trick-or-treating anymore...I go to parties with my friends *the bad kind* but I'm always careful and don't drink =))) All in all, I end up chaperoning my friends! LOL! Funnnnn........ =))) Can't wait till Christmas even though it's only October... *sigh* Can't wait for all those prezzies and yuuuuummmmyyyyy fooooood! 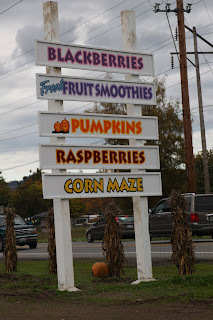 I have to know... what is a corn maze? Hold on a second...Miss J, you've never been in a corn maze? Wow. And here I thought you were so worldly. Kim, I'm with you on the Pumpkin Patch - I took Jack on Friday and we were there for THREE HOURS. I forgot how much fun it is! Heading to a corn maze Friday night with girl scouts (using flash lights in the maze) and now I am totally freaking out thinking of the Shining reference - yikes! I may have to just send the girls in alone.